Caught bait this morning and picked up clients at 5:30 at High point Marina. Looked for 30 minutes on 30' flats without seeing much so I decided to move to deeper flats. Found a nice school in 36' of water , put out 8 downlines and the Stripers started jambing the Herring. We were doing great until 3 other boats ran right up to us so I left. Found another school and put down on them and started banging them and was doing well until 4 boats saw us catching fish and ran right up to me and spooked the fish. 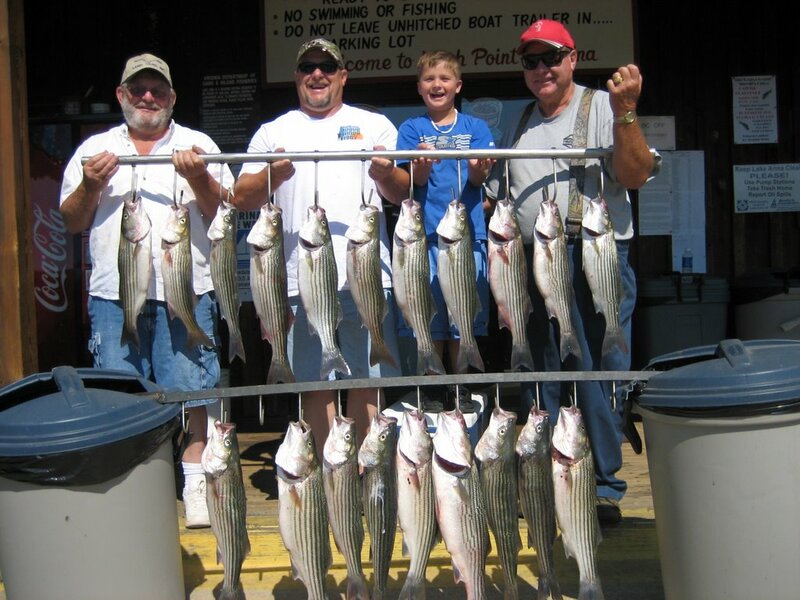 I have had enough of that so I picked up again and went to a place in the lake where no one could find me , found a school of Stripers and wore the fish and my clients out. 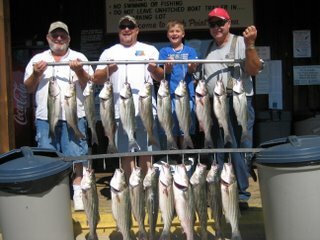 Clients caught over 40 Stripers and kept 20 by 9:30 am to have a great day on Lake Anna. How do you rig your downlines? 3 way swivel, or a egg sinker on the main line above a swivel? Also, if you don't mind sharing, where (in general) do you need herring? I know a couple places for shad, but herring, all I'm familiar with is using sbiki rigs at Dike 3. Can I jig them up around the bridge pilings with sabikis?